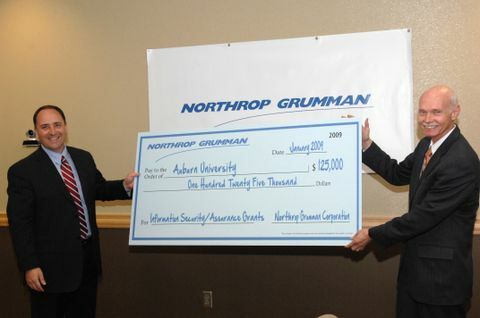 AUBURN, Ala., March 31, 2009 -- Northrop Grumman Corporation (NYSE:NOC) today presented a check for $125,000 in grant funding for information technology (IT) research to the Samuel Ginn College of Engineering at Auburn University. The ceremony was held this morning at Northrop Grumman's National Work Force Center at Auburn Research Park. Northrop Grumman provided two research grants to Auburn University. A $60,000 grant was given to the Department of Computer Science and Software Engineering for research on mission and business effects of technical risks and the Department of Defense Architecture Framework. A $65,000 grant was given to the Department of Electrical and Computer Engineering for research on intrusion resilience and real-time forensics. Highlighting the occasion were remarks from Timothy McKnight, vice president and chief information security officer for Northrop Grumman; Keith Glennan, vice president for strategy and technology for Northrop Grumman Information Systems' Civil Systems Division; and Dr. Larry Benefield, Dean of Engineering at Auburn University. "Northrop Grumman is committed to supporting educational advancement in science, technology, and engineering," said McKnight. "Through our partnership with Auburn University and the new National Work Force Center, we look forward to promoting these innovation initiatives." Northrop Grumman's National Work Force Center opened in Auburn Research Park in September 2008. "It is exciting to see that Northrop Grumman shares in the vision of the Samuel Ginn College of Engineering -- to cultivate the next generation of exceptional engineers," says Larry Benefield, dean of engineering for Auburn University. "We appreciate and look forward to a continued partnership that will benefit Auburn University, the state of Alabama, and the nation." The National Work Force Center is part of an initiative by the company to provide high-quality, cost effective technology centers within the United States as an alternative to off-shoring. Auburn Research Park is one of seven such facilities in the country. Others include Corsicana, Texas; Fairmont, W.Va.; Helena, Mont. ; Johnstown, Pa.; Lebanon, Va.; and Rapid City, S.D. As an information systems powerhouse, Northrop Grumman is a top provider of integrated, complex, cyber security solutions to the U.S.government, state and local governments and commercial businesses. As an industry leader in all aspects of computer network operations, Northrop Grumman is offering customers innovative solutions to help secure our nation's cyber future.